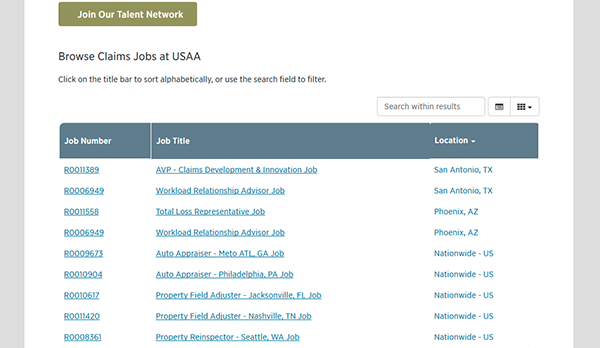 The USAA job application can be accessed via the company’s careers website. 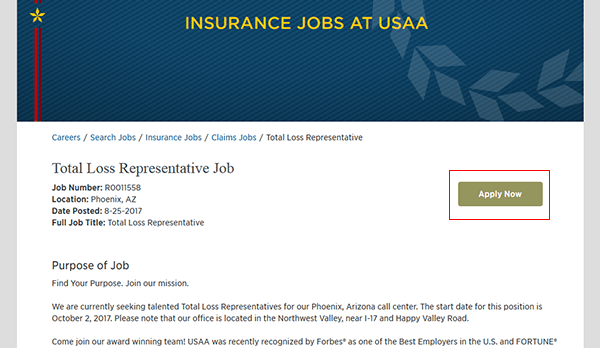 The links posted on this page will bring you to the USAA jobs site (where you can search for current openings and fill out/submit an application). Numerous types of careers can be searched/applied for including customer service, sales, insurance, IT, and design positions. Learn more about how to navigate the company’s jobs site by reading the guide posted below. About the Company: USAA is an American financial services company based out of San Antonio, Texas. The company was founded in 1922 and employs more than 22,000 people throughout the world. Step 1 – Click here to open the company’s jobs site in a new browser window/tab. 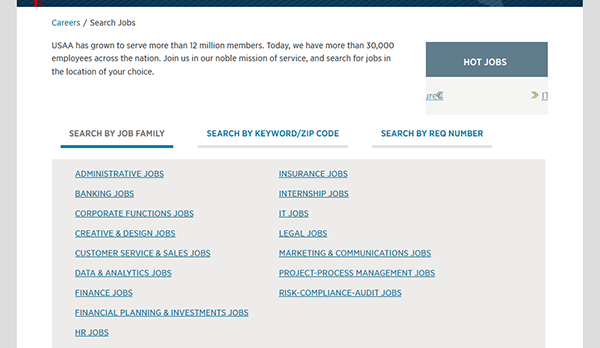 Step 2 – Press the “Search Jobs” button to go to the main job search page. Step 3 – Scroll down the page and select how you want to search the list of openings (i.e. search by job family, keyword/zip code, or req number). If searching by zip code/keyword enter a keyword into the first input field and then submit your zip code into the second field. Click the “Search” button to load the results. Step 4 – Press the job title/link of the position that you want to start the online application process for. Step 5 – Read the job description page and then click the button as outlined in the image posted below. Step 7 – Press the “Create Account” button at the bottom of the form to finish the account creation process. After your account/profile has been created you will be able to begin the application process. Step 8 – Submit all of the required information for each step/section of the application. After the form has been completed you will be able to submit it for processing.